Here are some snazzy birthday facts about 19th of January 1972 that no one tells you about. Don’t wait a minute longer and jump in using the content links below. Average read time of 10 minutes. Enjoy! What day was my birthday Jan 19, 1972? January 19, 1972 was a Wednesday and it was the 19th day of the year 1972. It was the 3rd Wednesday of that year. The next time you can reuse your old 1972 calendar will be in 2028. Both calendars will be exactly the same! This is assuming you are not interested in the dates for Easter and other irregular holidays that are based on a lunisolar calendar. There are 273 days left before your next birthday. You will be 48 years old when that day comes. There have been 17,259 days from the day you were born up to today. If you’ve been sleeping 8 hours daily since birth, then you have slept a total of 5,753 days or 15.75 years. You spent 33% of your life sleeping. Since night and day always follow each other, there were precisely 585 full moons after you were born up to this day. How many of them did you see? The next full moon that you can see will be on May 18 at 21:13:00 GMT – Saturday. Fun stat: Your first one billion seconds (1,000,000,000) happened sometime on September 27, 2003. If a dog named Miro - a Goldador breed, was born on the same date as you then it will be 262 dog years old today. A dog’s first human year is equal to 15 dog years. Dogs age differently depending on breed and size. When you reach the age of 6 Miro will be 45 dog years old. From that point forward a large-sized dog like Miro will age 5-6 dog years for every human year. Hundred Years’ War: Rouen surrenders to Henry V of England, completing his reconquest of Normandy. San Agustin Church in Manila is officially completed; it is the oldest church still standing in the Philippines. An army of 5,423 soldiers, led by General José de San Martín, crosses the Andes from Argentina to liberate Chile and then Peru. General Douglas MacArthur establishes the International Military Tribunal for the Far East in Tokyo to try Japanese war criminals. Almost 72% of all television sets in the United States are tuned into I Love Lucy to watch Lucy give birth. Iran hostage crisis: United States and Iranian officials sign an agreement to release 52 American hostages after 14 months of captivity. The barge North Cape oil spill occurs as an engine fire forces the tugboat Scandia ashore on Moonstone Beach in South Kingstown, Rhode Island. What does my birthday January 19, 1972 mean? Your birthday numbers 1, 19, and 1972 reveal that your Life Path number is 3. It represents vision, imagination and joy of living. You possess a great talent for creativity and self expression. The following celebrities also have the same life path number: Jeremy Shada, Nicholas Evans, Marc Breaux, Leila Hatami, Robert Nebřenský, Rodney Crowell, Billy Crudup, Kate DeAraugo, Guo Degang, Simon Russell Beale. What is the birthday horoscope for Jan 19, 1972? The Western zodiac or sun sign of a person born on January 19 is Capricorn ♑ (The Sea-goat) – a cardinal sign with Earth as Western element. The ruling planet is Saturn – the planet of discipline. According to the ancient art of Chinese astrology (or Eastern zodiac), Pig is the mythical animal and Metal is the Eastern element of a person born on January 19, 1972. Fun fact: The birth flower for 19th January 1972 is Carnation for friendship. What is the Love Match for Jan 19, 1972? When it comes to love and relationship, you are most compatible with a person born on January 19, 1974. You have a Love Match compatibility score of +130. Imagine being in love with your soul mate. On the negative side, you are most incompatible with a person born on July 11, 1953. Your incompatibility score is -184. You’ll be like a cat and a dog on a love-hate relationship. Arf-arf, I want to bite you. Meow-meow, stay away from me! The number-one hit song in the U.S. at the day of your birth was American Pie by Don McLean as compiled by Billboard Hot 100 (January 22, 1972). Ask your parents if they know this popular song. I do not know how you feel about this, but you were a female ♀ in your last earthly incarnation. You were born somewhere around the territory of Western Africa approximately on 925. Your profession was medicine man, surgeon, herbalist. How many babies were born on January 19, 1972? Base on the data published by the United Nations Population Division, an estimated 121,907,602 babies were born throughout the world in the year 1972. The estimated number of babies born on 19th January 1972 is 333,081. That’s equivalent to 231 babies every minute. Try to imagine if all of them are crying at the same time. What is the popular baby name on 19 Jan 1972? 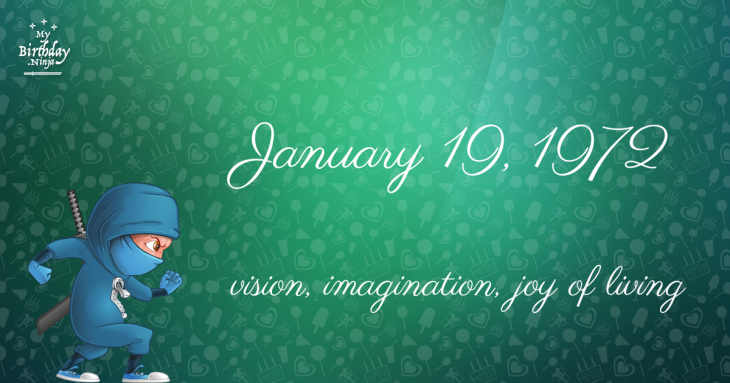 Here’s a quick list of all the fun birthday facts about January 19, 1972. Celebrities, famous birthdays, historical events, and past life were excluded. 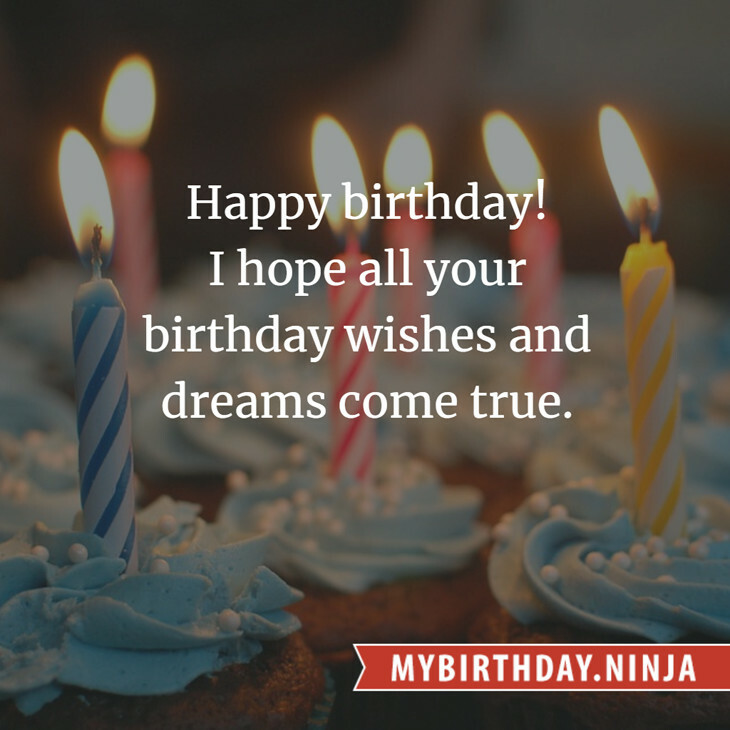 Try another birth date of someone you know or try the birthday of these celebrities: July 5, 1956 – Patsy Pease, American actress; December 2, 1969 – Yang Hyun-suk, South Korean singer-songwriter and producer (Seo Taiji and Boys); August 28, 1992 – Max Collins, American-Filipino model and actress.